Here it is! 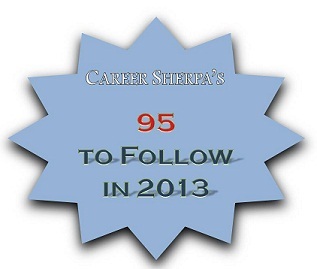 My list of 95 99 folks I greatly admire and hope you will follow in 2013. These are people who are active on Twitter almost every day and provide career advice and job search information. Many have their own sites and/or write for other outlets. You will find good quality content in their stream, not just their own. If you don’t create lists, you won’t like Twitter. They are a great way to organize the information you skim! You can follow any of my lists below and save yourself the effort! Wow, so who did I miss? Who would you add?